Bearings with Flexible Rollers are ideal to withstand shock loads like Hot Rolling Mills, Pigcast conveyers, continuous casting Rolls & Dusty atmosphere like coal crushers and Roller hearth furnace. JMC Flexible Roller Bearings are made of series of helically wound rollers which are assembled alternately right hand and left hand in a hardened steel retaining cage. This cage accurately aligns & spaces the roller and consists of two retaining rings which are held in a parallel & concentric position by stay-bars. These stay bars are shouldered at each end and riveted with a domed head. The retaining rings are counter bored to a suitable depth to ensure that the rivet heads do not project beyond the face of the ring. 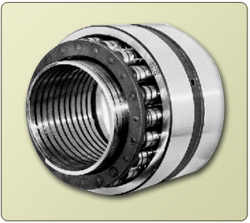 The Rollers which are the most important part of the Bearing are made from billets of spring steel. When in strip form they are helically wound with right or left hand spirals and then accurately cut off to length. They are then chamfered, heat-treated and ground to very accurate sizes. The inner and outer races are steel cylinders of chrome steel hardened and ground to precision limits and high finish. The complete bearing thus made up of three separate units. The fact that the inner race can be mounted on the shaft and the outer race fitted in the housing separately while the roller assembly can be inserted when the components parts of the machine are brought together at a later stage is a feature which is appreciated by engineers as it very often makes possible considerable economy in production. 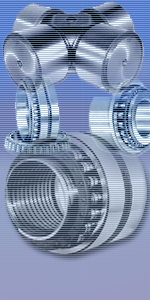 Flexible Roller Bearings with flexible inner and outer races are also used where there is space restriction. These flexible races involves very less thickness and cross section but at the same time can take up heavy load. Such bearings are very popular in Hot Rolling Mills.